WASHINGTON -- Secretary of State John Kerry said Monday that the Obama administration was willing to talk with Iran over deteriorating security conditions in Iraq and was not ruling out potential U.S.-Iranian military cooperation in stemming the advance of Sunni extremists. The Pentagon, however, quickly tamped down speculation that the United States would coordinate or consult with Iran on any potential military intervention. It also flatly ruled out the idea of "joint military operations" with Iranian armed forces, which the U.S. has long accused of fomenting unrest and backing terrorism in Iraq and throughout the Middle East. Kerry also said U.S. drone strikes "may well" be an option in Iraq, to help the government beat back the al Qaeda splinter group known as the Islamic State of Iraq and Syria (ISIS). The jihadist militants surprised many last week by seizing two major cities in northern Iraq, Mosul and Tikrit, almost without a fight, and by vowing to attack Baghdad. What options does the U.S. have to thwart ISIS? In a Monday interview with Yahoo! News, Kerry said Washington was "open to discussions" with Tehran if the Iranians can help end the violence and restore confidence in the Iraqi government. Asked about possible military cooperation with Iran, Kerry said he would "not rule out anything that would be constructive." However, he stressed that any contacts with Iran would move "step-by-step." "At this moment, I think we need to go step-by-step and see what in fact might be a reality. But I would not rule out anything that would be constructive in providing real stability, a respect for the constitution, a respect for the election process and a respect for the ability of the Iraqi people to form a government that represents all the interests of Iraq," he said. "We are open to any constructive process here that would minimize the violence." Later Monday, a U.S. State Department spokesperson said possible talks with Iran over Iraq would not be about military cooperation but would seek to urge Tehran to press the government of Prime Minister Nuri al-Maliki to resolve its problems in a non-sectarian way. "We believe the focus should be on encouraging Iraq leaders to govern in a non-sectarian way, and our discussion wouldn't be about cooperating or coordinating on military goals," State Department spokeswoman Jen Psaki told a daily briefing. At the Pentagon, spokesman Rear Adm. John Kirby said there that while there may be discussions about regional security with the Iranians, those would not include military coordination. "We are not planning to engage with Iran on military activities inside Iraq," said Kirby. U.S. officials said earlier there was a possibility that a senior American diplomat might discuss Iraq with an Iranian delegation at nuclear talks in Vienna this week. CBS News senior security analyst Mike Morell, former deputy CIA director, said Monday on "CBS This Morning" that partnering with the Iranians would not be in the best interests of the United States. "There is a long-term struggle going on in the Middle East between Iran and our allies, Saudi Arabia, the United Arab Emirates, and the moderate Gulf states -- a fight going on for influence -- and I don't think we want to give Iran a foothold in Iraq," said Morell. "We need to help the Iraqis, the moderate Gulf states need to help the Iraqis. We need to keep Iran out of this." CBS News correspondent Clarissa Ward reported Monday from Baghdad however, that while the U.S. government has been reluctant to get militarily involved in the rapidly unfolding crisis in Iraq, Shiite-led Iran is already fully invested in the fight. Ward said CBS News sources had confirmed that the head of Iran's elite paramilitary Quds force, Qassem Suleimani, is in Baghdad already, along with a contingent of Iranian fighters. 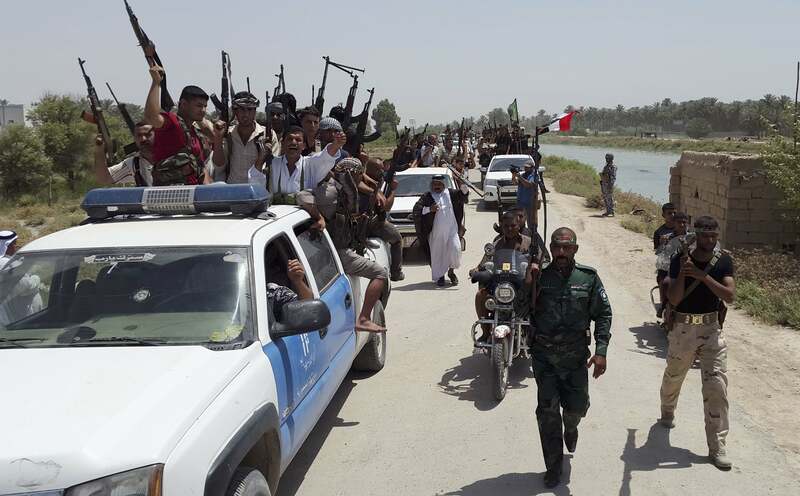 The Sunni militants of ISIS captured another Iraqi town on Monday, meanwhile, the latest blow to the nation's Shiite-led government a week after it lost a vast swath of territory in the country's north. The town of Tal Afar, with a population of some 200,000 people, mostly ethnic Shiite and Sunni Turkomen, was taken just before dawn, the mayor and residents told The Associated Press. The ethnic mix of Tal Afar, 260 miles northwest of Baghdad, raises the grim specter of large-scale atrocities by Sunni militants of the al Qaeda-inspired Islamic State of Iraq and Syria, or ISIS, who already claim to have killed hundreds of Shiites in areas they captured last week.